If today’s political scene has left you feeling less than hopeful, consider the work of Steve Phillips. Phillips is a civil rights lawyer and senior fellow at the Center for American Progress who has analyzed the body electorate and its major population growth among people of color. 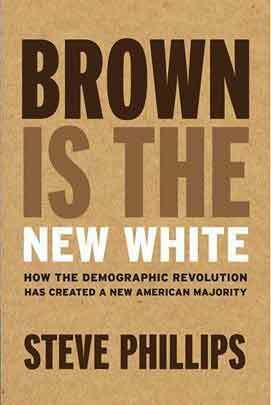 His book, “Brown is the New White: How the Demographic Revolution Has Created a New American Majority,” lays out the progressive power in the numbers: Combined, progressive people of color and whites make up 51 percent of all eligible voters today. That’s the underlying message behind Phillip’s best-selling book – that despite some of the dominant rhetoric of this year’s presidential cycle, progressives hold the cards. Phillips was looking forward to casting his first vote for president when he began following Jesse Jackson’s 1984 presidential campaign. He was only 20, and he describes the experience as transformative – melding his personal interest in the civil rights movement and Martin Luther King Jr. with its tangible legacy in the electoral sphere. He felt a part of the continuum moving forward, witnessing real change taking shape. It was that experience that helped him see the potential of Barack Obama’s 2008 presidential bid. He co-founded PowerPAC+, which became the largest independent voter mobilizer backing Obama and other candidates. Phillips spoke to Street Roots about the book prior to his engagement with the Color PAC Action Fund in Portland. We started by clarifying, for the purpose of his new book, what he defines as progressive. Steve Phillips: The definition of progressive is admittedly elusive. I felt the best data set are the exit polls. So I use the 2012 exit polls as data – both because it was after the “hope and change” enthusiasm had worn off, but also because the president had a record: universal health care, immigration reform, equal pay for women. People voted for his record, so he had gone on the record and those were the elements. That’s why I define progressive on lines of universal health care, immigration reform, equal pay for women, marriage equality – that was an agenda that he was clear about and people voted to for four more years of that. So that gives us the data set, so who wanted four more years of that is 81 percent of voters of color and 39 percent of white voters. And when you apply those percentages to the entire eligible voter population in the country, that’s 51 percent of the country. That is the urgency of this book at this time. Which direction are we going to go? And to fuse a sense of urgency into the Democrats that this structural advantage can be very fleeting if they don’t invest heavily in it. Joanne Zuhl: Fleeting in that the progressives are not going to be progressives any longer? S.P. : Because the conservatives and the Republicans do see this math, and they have a dual strategy – suppression and seduction. The suppression continues at pace – undermining the Voter Rights Act, creating voter ID laws – and the seduction continues. They’re running a rainbow coalition slate for president. And a lot of their top elected officials – Nikki Haley, Tim Scott, Marco Rubio – this rainbow tableau that on its face can be appealing. J.Z. : You talk about the changes in laws, movements and population since 1965. What’s the diverging course that has, even today, the white population directing the course of politics? S.P. : Actually, in 2012, the African-American turnout was higher than the white turnout. That was the first year that had happened. The black turnout has continued to increase over the past decade. The Latino and Asian population voting is a different issue. It’s tied into those ’65 realities, but there is a shorter history in this country. Seventy-four percent of Asian-American adults are foreign born, because it was illegal for Asians to come to this country. And so there’s not the same tradition in history in that sense. And then the biggest challenge is around Latinos, which is kind of a double-edged sword. If you come from a country where voting was punished or somewhat risky, there’s a cultural tradition on some level. But also they’ve not been invested, with civic engagement coordinators in churches and faith-based institutions. Actually, I was down in San Diego recently, and I learned that Mexico is required by law to advertise PSAs about their upcoming election in San Diego because there are a lot of Mexicans in San Diego. So the country of Mexico is advertising its upcoming election, which is in July. But there’s no advertising in San Diego for the San Diego elections (in terms of it being a law). So we do not invest in informing and prioritizing and getting everybody out to the polls. J.Z. : In this current election, where are the candidates getting it wrong and where are they getting it right when it comes to courting this progressive bloc? S.P. : I think that Bernie’s focus on inequality resonates in a country and communities that have great amounts of inequality. I think his language around criminal justice reform has gotten much better and much stronger. That’s all for the good. I still think he has a way to go in terms of appreciating the distinctness of racial inequality, separate and apart from economic inequality in this country. So the level of emphasis of the singularity of racism, I would say, is insufficient. On Hillary’s side, she gets the singularity issue. She speaks to it better. She is challenging whites to engage in owning and understanding their privilege, and she’s introducing to the public discourse language about race that I haven’t heard in 30 years. S.P. : She has said you have to look at race as a distinct entity. She gave a speech in Harlem recently specifically talking about that issue. She called for a hundred-plus-billion-dollar program to address the inequality in the communities of color, so that kind of specific focus is helpful. I still think she should go further. It’s almost like you need to blend the two of them. You have her race-specific lens and then Bernie’s radicalism melded together. J.Z. : It’s a two-way street. If you’re a progressive voter and you don’t have a candidate who reflects your views, you’re cornered. It’s also about getting more people of color and progressives engaged in politics. Where are we with that side of it? S.P. : It’s about the (future) candidates, and also holding the current candidates accountable. There’s more that should be done to pressure the current Democratic candidates who have raised between them $200 million. Can they take $2 million to create or support existing efforts? The Black Lives Matter movement and their allies are trying to identify and run candidates for district attorney and to train operatives to run those campaigns. Can these campaigns put $2 million to that effort and partnership with Black Lives Matter and seed the ground for there to be new leaders and new candidates? That helps advance the movement. It sends a signal to people who care about those issues, and it brands them in connection with them. That’s something that can be done right now and people need to be challenged on. Someone in the movement said that people see the protagonist in social change as somebody else. Part of my mission with this book is to let people see that we have a majority now – we actually can make the change. So people can step up and run. People can probably have a bigger impact on getting elected than they may even fully appreciate or realize. J.Z. : What you’re talking about seems like an extension of your work on the Obama campaigns. This idea of taking back ownership of the political system from the corporate world and bringing it back to the people. It seems a revisioning of 2008 and the “Hope” campaign. S.P. : Yes – and the actual meta lessons of 2016 is that the big corporate-donor dominance is not carrying the day. Jeb Bush raised 100-plus million dollars and went nowhere. Whereas Bernie has 5 million, small-dollar contributions, and that has really propelled him to the place he’s in. I think that says something about the limits of big money and the potential of small money collected and aggregated through our technological tools. J.Z. : It often seems that the politics addressing people of color are relegated to the extremes – reactions to police behavior, overt discrimination and messaging how to alleviate violations on their lives. And that often seems dismissive of real proactive discussions around alleviating poverty, strengthening our education system, and so on. S.P. : The language and the topics changed as the election moved from Iowa and New Hampshire to the South. Now, as they move out of the South, are they going to continue talking about the issues they did in the South? North Carolina, Virginia even Georgia are places that could be competitive if there could be an inspired, mobilized black vote. Another big test or challenge is going to be what happens with the vice presidency? Are we going to finally desegregate the office of vice president? We’ve never had a person of color in that office. It’s strictly of calculation of what you think the electorate will tolerate. And either of these older white candidates are going to need a younger, inspiring person of color to balance out the ticket. I think it’s absolutely necessary for either candidate to get the large, enthusiastic support they’re going to need if they’re going to win. J.Z. : Beyond the history of overt policies against minorities, what’s the consequence when progressives and people of color aren’t engaged with the election. I think of your example of the G.I. Bill, which actually had many racially discriminatory policies built into it. What are we losing today, policywise? S.P. : The clearest, the most recent, is the Democrats lost the House and lost the Senate. And then with that, lost the opportunity to pass immigration reform. So we had that moment, and the potential to move those things forward, and lost it. And now we’re stymied on the Supreme Court pick. Had we not lost the Senate, we could, as you’re supposed to do, nominate a replacement and put that person on the court, which then has policy implications for all the issues before the court. Union rights, immigration issues, freedom of choice. All those issues. J.Z. : As a figurehead, has Obama carried the day in bringing along this progressive body? S.P. : It’s almost like which sectors? There was the video with the young black girl crying when she heard that Obama was not going to be president anymore. I think in terms of the children of this country, who have only known the Obamas as the first family, that is going to be hugely significant to the future of this country for decades. In terms of the immediate next level of the progressive political infrastructure, we’re not where we need to be. So there needs to be both a bench of candidates and operatives. Too much of the political party infrastructure is still controlled by whites and not focused on communities of color, so there’s still a lot to be done. J.Z. : You mentioned earlier the distinction between racial and economic inequalities. Our newspaper works with people in poverty. What needs to happen to bring more people of poverty into our political discussions? S.P. : Part of it is delivering. There’s a video the White House put out of a young conservative white man introducing the president, saying that Obamacare saved his life. That he had opposed the president both times, and he was atoning for that. Providing a policy agenda which delivers for everybody is part of the issue. Too little of our politics is explicitly relevant to poor people in terms of seeing why they have to participate, how will it actually improve their lives directly. I think the public policy debate is too timid and too narrow. For example: What I talk about in the book is a wealth tax, not just an income tax. The top 1 percent in this country has $26 trillion in wealth. That’s a household of $13 million or more in assets. If you just did a 2 percent wealth tax, you could end poverty – just on the top 1 percent of people in the country. And it doesn’t even have to take money from them. With your stock market returns, you should be able to make 10 percent on your money, so we’re saying just make 8 percent and we’ll end poverty. If there was a campaign and it was a part of our dialogue where the top 1 percent will just have to get richer a little slower, then you can end poverty – that would be very different. Joanne Zuhl is the managing editor of Street Roots.